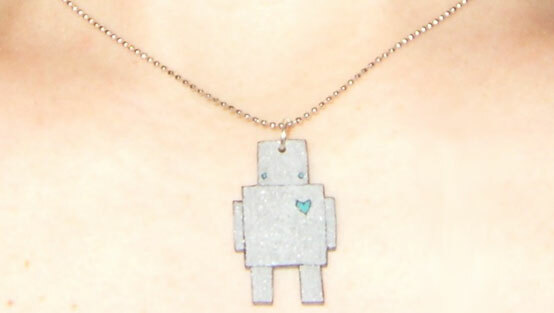 For the third installment of Robot stuff on Etsy I present the Silver Robot of Love with a Turquoise Heart pendant. This is for all the Robot lovin’ ladies in the house. This pendant is handmade of sealed plastic. Although it doesn’t come with the chain, it has a jump ring that you can either string onto a chain or stick onto a keychain. I would totally sport one of these to a Flash Meetup or social networking event. This pendant is a total bargain at $5 with only $1 for shipping. Get it at steffffff’s store on Etsy. Next Post: Stop the Letter Presses!